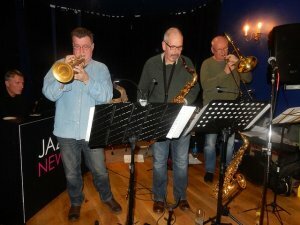 Kevin Eland (trumpet/flugel); Alan Marshall (alto/tenor); Eddie Bellis (trombone); Graham Don (piano); Bradley Johnston (guitar); Alan Rudd (bass guitar); Sid White (drums). Li’l Darlin’; St. Thomas; Filthy McNasty; Sandu; Straight no Chaser; Doxy; Del Sassa; Curious George and Basie Street were just some of the numbers I recognised, or were occasionally identified by frontman Bellis, The set list gives a broad indication of where Lickety Split come from. Neither east coast or west but straight down the middle, mainstream to modern, swing to bop and beyond, Seven good men and true, all masters of their craft. Although we were on the second floor, Eland seemed to be blowing two flights higher. Think Maynard and Cat. The previous evening Marshall had been playing pre-1940’s swing with the NCRO, this evening he’d moved forward twenty or thirty years, I wonder where he’s playing tomorrow, in a Tardis perhaps? Bellis blows ‘bone like a ‘bone should be blown. None of this typewriter twittering, but earthy sounds that hark back to the instrument’s jazz roots without losing track of time or identity. Many words have been written about Brad on guitar – suffice to say that he fits in here as easily as he does in any situation. Likewise Rudd. He does the job irrespective of style. Upright acoustic or sit down electric he’s our man. On drums, Southpaw Sid was, as ever, a knockout but the big surprise was Graham Don on piano. A last minute dep., he produced some stunning solos that made those who were only familiar with his limited exposure in the SSBB realise just how good he was.